When you submit a form, make a donation or purchase, or register in any way on our website, you may be asked to providepersonally identifiable information(“PII”), which is information that can be used to identify you, including your name, address, phone number, email address, date of birth, or payment information. We use the PIIwe collect from you to send you our newsletters; to expedite your requests for prayer or any other requests you make of our Ministry; to send periodic emails regarding your order, prayer, or other products or services; to follow up with you on correspondence or phone calls we received from you (for example, in live chat, email, or phone inquiries); to assist us with the shipping of any purchases you may have made; or to contact you by phone, email, or mail with messages from the Prophet. 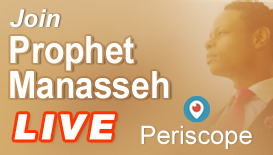 If you wish to make changes to any of your PII that is collected through this website, you can request changes by emailing us at info@prophetmanasseh.com. We understand the importance of the security of your information, and we maintain reasonable and appropriate measures designed to maintain information we collect in a secure manner. When you use this website, we may automatically collect non-personally identifiable information from you. We, along with third-party vendors such as Google, use first-party cookies (such as the Google Analytics cookies) and third-party cookies (such as the DoubleClick cookie) or other third-party identifiers to track user experience. We may also collect your Internet Protocol (“IP”) address, internet tags, or navigational data. Your browser may allow you to disable cookies, but please note that some features of this website could be affected if you disable cookies. We will not share your PII with third parties unless we provide youwith advance notice. This does not include website hosting partners and other parties who assist us in operating our website, conducting our business, or serving our users, so long as those parties agree to keep this information confidential. We may also release PIIwhen its release is necessaryto comply with the law, enforce our site policies, or protect ours or others' rights, property or safety. However, non-personally identifiable information may be provided to thirdparties for marketing, advertising, or other uses. We honor Do Not Track signals and we do not track, plant cookies, or use advertising when a Do Not Track (“DNT”) browser mechanism is in place. Our website is not intended for or directed to children under the age of 13 years old and we do not knowingly collect any PII from children under the age of 13 years old. If you are the parent or guardian of a child under the age of 13 years old and you believe that the child has provided us with PII, please contact us. If you are receiving emails from us and would like to stop receiving such emails, you can follow the instructions at the bottom of our emails to unsubscribe. We will honor unsubscribe requests promptly. MJM does not charge for receiving text message alerts. Message and Data Rates May Apply. Check your text messaging plan with your carrier. 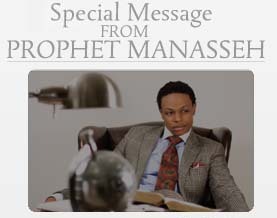 For help, text HELP or email info@prophetmanasseh.com will send you recurring text messages. To stop receiving text messages at any time, text STOP to 411411. Supported carriers include: AT&T, Verizon Wireless, MetroPCS, Sprint, Boost, T-Mobile, Alltel, Virgin Mobile, U.S. Cellular. Carriers are not liable for delayed or undelivered messages. By opting into MJM, the end-user agrees to receive pre-written marketing messages from or on behalf of MJM via short code 411411, and understands that consent is not a condition of purchase or receiving services provided on this website.